NEW YORK—Patrick Byrnes shares many quiet hours in that enigmatic realm of the artist painting the model. Hours, weeks, or months, it does not matter how long he paints them, as long as he continues to strive to express the beauty of each person’s particularity. Through that process he hopes to create works that will feel compelling and universal. That may seem paradoxical, yet Byrnes admits it’s a long endeavor to bring to light. 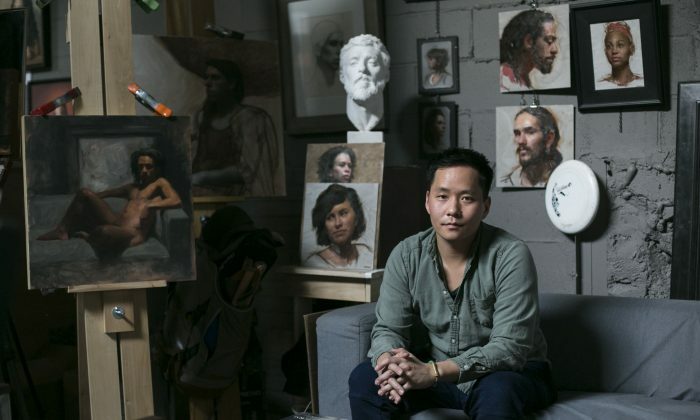 “I’m being patient,” he said softly, creating a sense of intimacy in his studio space at Grand Central Atelier, which is partitioned by thin grey walls that don’t reach the ceiling. “It’s so fulfilling to be in front of the model, trying to get it right. … I think it is going to be a lifelong obsession,” he said. It took a little meandering for Byrnes, now 32 years old, to find his calling. After studying art history and English at Saint Andrews in Scotland, considering being a poet or journalist, and dabbling in theater with the Steppenwolf Theatre Company in Chicago, he took a continuing education figure drawing class with Diana Stezalski at the Art Institute of Chicago, where he worked in human resources. That class inspired him to want to draw and paint better. Stezalski encouraged him to study at her alma matter, The Florence Academy of Art. After a year in Florence he was drawn by the works of Jacob Collins and other artists in New York at the Grand Central Atelier, where artists also learn the classical methods of drawing, painting, and sculpture, but with a different approach. For the past two years since he finished his studies, he’s been an artist in residence at Grand Central, where he also teaches. “Something really spoke to me about the careful slow study of the human figure and carrying on this tradition,” he said. He offered espresso made with his small Nespresso machine, tucked behind a pencil drawing on his shelf. He reminisced about the slower lifestyle in Italy. He likes the idea of calling his art, small-batch work, comparing it with the slow food movement, which emphasizes quality, authenticity, and community. Byrnes was born in South Korea and adopted when he was 7 months old by his Irish- and Welsh-American parents. “Hence my super Irish name,” he said. He does not feel any affinity to Korean culture, other than craving Korean food. When he spent a summer in South Korea during his college studies, he said he found the culture shockingly different, but felt it was interesting how he could physically blend in as part of the majority, and be anonymous as long as he did not speak. “There is a slight disconnect in the way I sometimes apprehended environments and visual information because of a constant feeling of otherness. I often contemplated what my life would have been like had I not been adopted or adopted by a different family in a different part of the world,” he said. Some of Byrnes’s portraits, hanging in his studio space, showed a beautiful sadness or nostalgic expression in the eyes. “That’s the kind of face I would rather look at. I don’t want to look at someone who is smiling,” he said chuckling. All of them radiated a gentle demeanor, like his soft-spoken voice. They are all set against a plain background. “For now, I don’t want the person I am painting to have to service a narrative. I just want them to be who they are in that moment,” he said. He uses an alla prima technique—a direct, one-layer, wet-on-wet painting method. It literally means first attempt in Italian. For now it has been a good way for him to figure things out and continue learning how to create certain effects. Byrnes doesn’t necessarily choose conventionally beautiful people who are splayed throughout glossy fashion magazines or in mainstream media. The high-skill, attention, and care he puts into his work renders whomever he chooses to paint beautiful. “There’s something really compelling about a portrait done from life because it’s such an intimate experience. Without wanting to sound hyperbolic, I think of it as transformative,” he said rather bashfully. He pondered his understanding of beauty. “If you look at a nose and were asked to idealize it, what would you make that nose look like?” he asked. “When someone goes on the model stand, you become more vulnerable to the particularity of them, and it’s their particularity that is beautiful. It’s not about ‘Oh, that person has a very straight nose, or large eyes, or a smooth complexion,’ it’s about the exact tilt of their brow, or the way their nose flares out just so at the bottom, or the delicate character of the upturn of the corners of their mouth. When you are working from life, moment by moment, you are learning the person’s beauty as you appreciate and translate all of those little details,” he said. Byrnes pointed out that his paintings don’t need to go along with a 1,000-word statement for them to be understood, nevertheless he also appreciates nontraditional contemporary art. “I definitely don’t like to oppose contemporary art because I enjoy learning about it, and a healthy avant-garde is essential, but there also needs to be a perennial or academic form and that form doesn’t need to be boring, conservative, religious, or sentimental. It doesn’t necessarily need to be that, it can be exciting and feel vital. It lives in this moment, and it can be made really well,” he said. He recounted how he and Anthony Baus, another artist, played with the idea of installing big neon letters outside of Grand Central Atelier that would say, “ART.” They imagined that people going inside would then be completely surprised to actually see traditional art, instead of a conceptual installation. Byrnes admires the old masters like Rembrandt, Rubens, and Velázquez—the usual suspects he called them—and is keen on following a lineage of making portraits and figure paintings that are psychologically affecting, sensitive, and compassionate. “A painting can have this physical, sensuous presence that enhances the viewer’s experience because they can respond to both the image and its physicality. That is what I have been trying to do,” he said. “I think in my 50s and 60s, I’ll be making works where my technique and the content of my work are both at a very high level and feel meaningful and true,” he added. There’s a whole young generation of people who are making art that is traditional and skilled, calling for an equal skill in connoisseurship. Byrnes feels very fortunate to be able to sell his work though one of the few art dealers selling traditional art. He will also show two to three paintings in a group show at Eleventh Street Arts in Long Island City, opening on April 15. “This Is New York” is a feature series that delves into the lives of inspiring individuals in New York City. See all our TINYs here: epochtim.es/TINY or follow @milenefernandez on Twitter or @milenejf on Instagram.